Meg enjoys the Cloudbabies, which has been on our screens for a year. There's something calming about its soundtrack, colours and big beaming happy faces! We were sent two of the latest Cloudbabies toys to review. Maegan really liked the size of the figure and skyhorsey twin pack as they were comparable to some of her other play sets so she could really let her imagination rule in her little role play games! The size also meant that this pair can easily pop into my handbag or the nappy bag for when we are on the go! The colours and attention to detail is fab, the quality is excellent and this set gets top marks for durability - even after a month of being sucked and chewed by a teething toddler, played with in the garden and taken just about everywhere - this set still looks as new! Easy to clean without any little gaps or grooves for stuff to get stuck in too! The other toy we received was the pull along Skydonk featuring Bobo White. The wheels aren't quite perfectly round which makes Bobo White gently bounce up and down as if he is horse riding which I thought was a lovely touch! You can move his arms and head to change his pose and move the Skydonk's ears. The pull along cord is tied through a loop so you can remove it and use this as a push along you too. The Skydonk's colours are lovely and bright and both my children (aged 1 and 3) loved playing with this equally. I thought both toys were great value for money and would recommend to a friend. We've actually bought one of the figure and skyhorse twin packs as a gift for a birthday party we are going to as at £6, its perfect! Who looks after the sky? The Cloudbabies do! Whatever the weather, every morning they jump on their Skyhorsies and begin their busy day’s work looking after the sky and their Sky Friends: Sun, Moon, Rainbow, Fuffa Cloud and Little Star. Now you can re-enact the Cloudbabies adventures high in the sky, up, up in the clouds with the new collectable Figure and Horsey Assortment twin packs (RRP £5.99) each featuring one of the Cloudbabies and their corresponding Skyhorsey. Watch and sing along with the Cloudbabies and Bobo White as they have fun with their sky friends on the new Musical TV (RRP £9.99)! Accompanied by the Cloudbabies theme tune, pre-schoolers aged 12m+ will be spellbound as each rotating page reveals full colour adventures of the cloudb-bouncing friends. Skydonk and Bobo White are on a roll with the new Pull Along Skydonk (RRP £11.99)! Tipping back and forth as they trundle along, children aged 18m+ can have fun moving Bobo White’s head and arms into position as he rides off in search of mischief with his favourite friend! * I have not received any payment for this review. 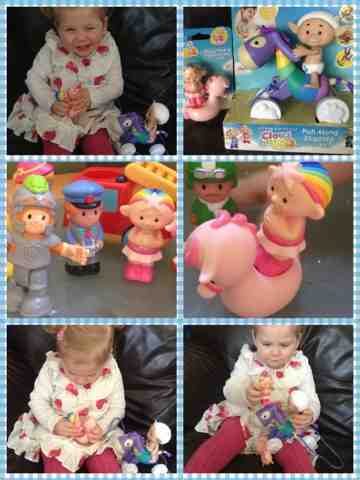 The toys were provided for the sole purpose of physically being able to carry out an honest review. All thoughts, photos and link choices are my own. Awh I love them! I've love to buy them all but it would really be for me (my inner child lol) more than my toddler. Its great that its they are affordably priced.